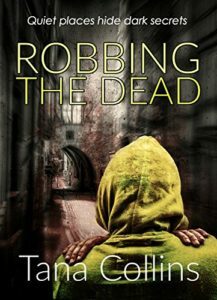 Robbing The Dead, by Tana Collins. Ten days ago, we posted that Tana Collins’ debut crime thriller, Robbing The Dead, was being released by Bloodhound Books. Since then, we’re delighted to report that Tana’s novel has sold almost a thousand copies. That’s roughly 100 per day. Now we know that everything’s relative – in the same ten days, the US President has had to fire a National Security Advisor for inappropriate conversations with Russian officials, invented an unnamed incident in Sweden which led to much of the world, including Sweden, scratching its head as to what he could conceivably be talking about, promised to create peace through armed force in a speech that chilled the world, declared Chicago was ‘totally out of control’ because seven people out of nearly three million city residents died in a night, invented a whole fictitious industry of paid protestors at his events, pretty much declared war on the FBI, and been shown up by the Canadian Prime Minister. But still, nearly a thousand books. In ten days. If we’re looking for a positive impact on the world, we know where the smart money’s going. Not for nothing, in the same ten days, it’s received 21 4-and-5-star reviews on Amazon, meaning people are not only reading it, they’re also feeling strongly enough to deliver the gold dust of debut authors, positive reviews and feedback, once they’ve finished. If you haven’t discovered Tana Collins and the Inspector Carruthers mysteries in the last ten days, don’t panic – Robbing The Dead is still available at Amazon, for all of you searching for an involving escape from the real world. We’d love to see Tana’s debut novel hit 2000 sales within its first 20 days on the market. Order your copy now, and become a Tana Collins fan this weekend.